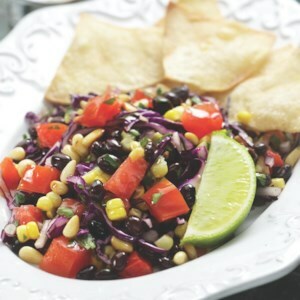 Find healthy, delicious black bean salad recipes from the food and nutrition experts at EatingWell. 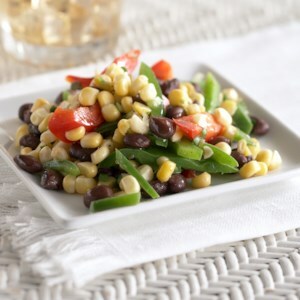 Jalapeño chile peppers add a pleasant spice to this chilled corn salad. If you like things a bit more spicy, leave in some of the seeds from the peppers. No cooking necessary and ready in just 25 minutes, this Southwestern-inspired recipe is a great choice for a quick lunch or dinner. Don't have leftover chicken? No problem--use turkey! Get all the protein -- 17 grams -- you need without the fat and cholesterol. 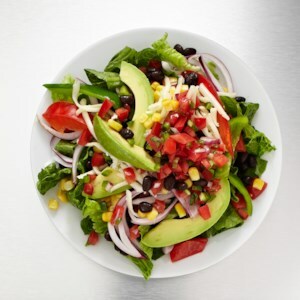 Loaded with fiber-filled beans, sweet corn, crunchy sweet pepper, smooth avocado, and spicy pico de gallo, this bold salad will satisfy your taste buds and appetite. 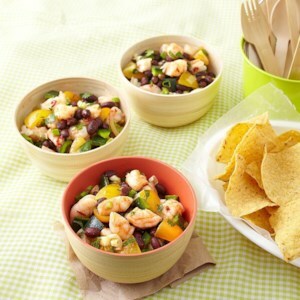 A classic black bean salad is a must for picnics and potlucks. This vegan version gets its creaminess from blended avocado. Any mix of salad greens will work well, but try arugula if you want to give this hearty salad a peppery kick. 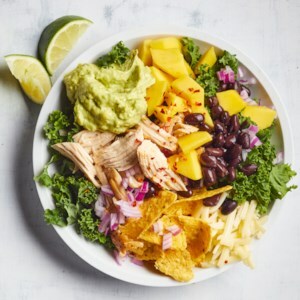 This healthy, super-fast salad recipe swaps out romaine for kale, giving you more than 10 times the vitamin C. Easy flavor hacks like store-bought ranch and pickled jalapeños help make a creamy, tangy and spicy dressing you'll want to drizzle on everything from salad to sliced veggies and shredded poached chicken. 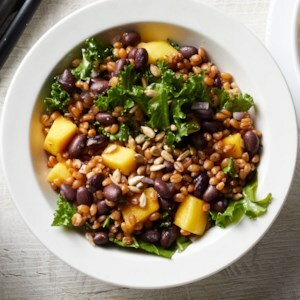 Wheat berries give this healthy grain-salad recipe a toothsome bite. 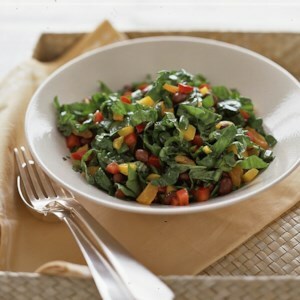 The chopped kale can be swapped for any dark leafy green, such as spinach or chard, if desired. 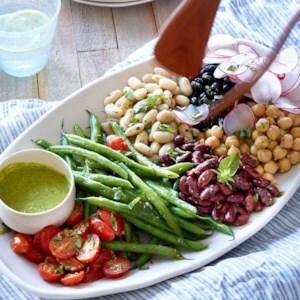 Channel your inner food stylist while arranging the beans and vegetables for this show-stopping composed bean salad recipe. 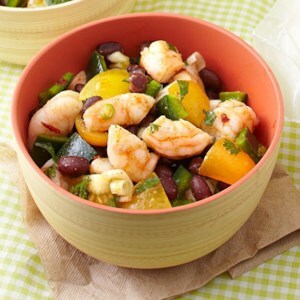 Serve at a potluck or for a beautiful salad at brunch alongside grilled chicken, scallops or fish. 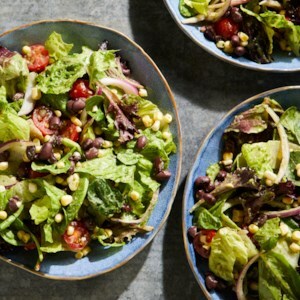 Here we top salad greens with black beans, sweet corn and grape tomatoes and bring it all together with a tangy avocado-lime dressing for a Mexican-inspired salad. 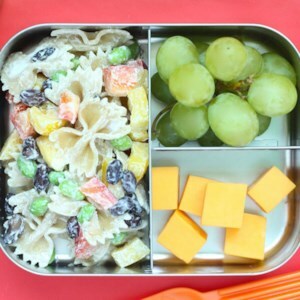 Try this salad for a take-along lunch. 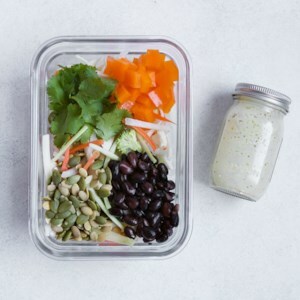 To keep the salad greens from getting soggy, pack the greens, salad toppings and dressing in separate containers and toss them together just before eating. This simple, fresh-tasting salad adds delicious variety to grilled foods, such as salmon, halibut, chicken or pork. 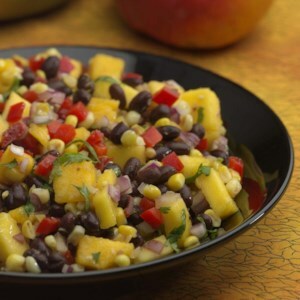 Browning the corn in a skillet gives it a nutty, caramelized flavor that contrasts with the sweetness of the mango. 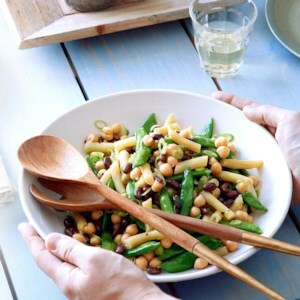 Traditional three-bean salad gets a healthy, fresh spin with the addition of black soybeans, snap peas and a tarragon-infused dressing. Find black soybeans near other canned beans; they're a sweeter, creamier relative of the green ones you're probably familiar with. The vibrant colors of this salad--orange, red, black and green--signal that it's loaded with phytochemicals, vitamins and minerals. 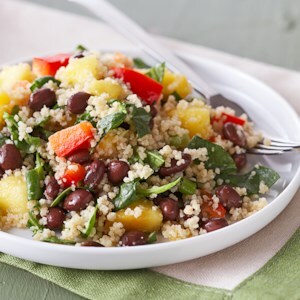 And since it features both quinoa--a “complete” protein with all the essential amino acids--and black beans, it's a vegetarian protein powerhouse. Serve on a bed of Boston lettuce or in a pita pocket. 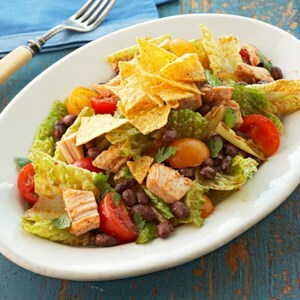 Sherry vinegar deepens the lively flavors of this Southwestern salad, and beans and fresh tomatoes keep it moist. Make it a meal: Strawberry-Mango Margarita Compote is a cool finish. Sweet, sour and spicy notes produce a captivating blend of flavors here. Here's a great make-ahead dinner--and leftovers are welcome for lunch the next day. If you make it ahead, don't add the salt and pepper until just before serving. 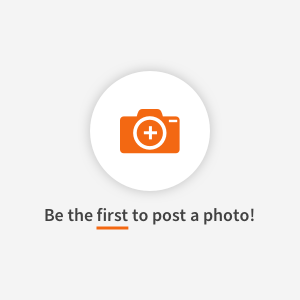 That way, the salt won't render the vegetables soggy and the pepper won't lose its bite. 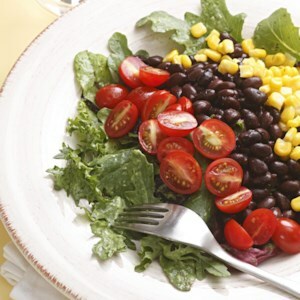 Make It a Meal: Scoop up this salad with warm corn tortillas.